Dreamy romantic flowers can set the stage for an elegant affair and our Draping Plumeria Silk Floral Spray certainly creates a magical ambiance! This spray has 5 shoots and the entire length is 26" long by 7" wide. 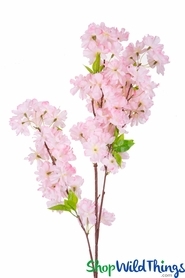 The stalk is 4" while the 5 flowering stems with leaves vary from 17" long to 22" long. 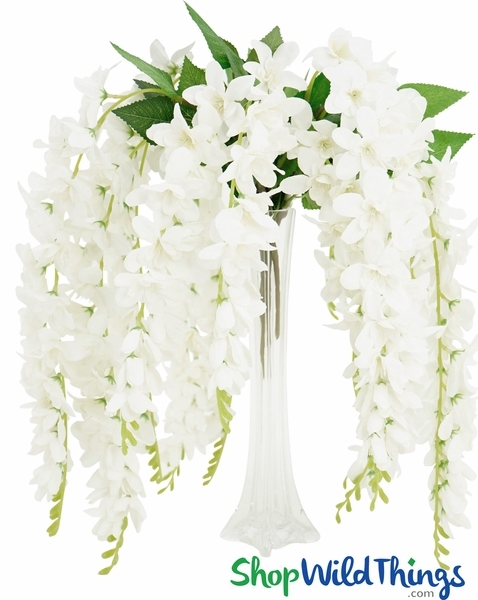 The gorgeous white flowers range from 2" to 2 1/2" wide. 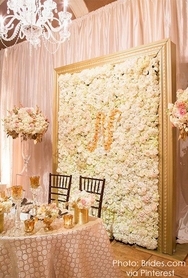 Faux florals have come such a long way in visual quality and materials used. 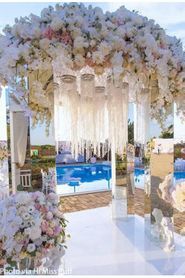 Combine that with the affordability aspect, tolerance for transportation, weather and the reusability factor and artificial florals will be your new best friend for weddings, galas, events and everyday enjoyment! The main image that shows these standing in a vase shows 3 of these sprays together in one Eiffel Tower Vase. They are so full and pretty! Plumeria is also known as Hawaiian Frangipani, the gorgeous flower adorning leis, and it's a popular choice among event planners and wedding coordinators. Create a blissful Ceremony Structure by draping from a 4-Post Event Canopy, ceremony arches and balcony railings. The look of this tropical cascading spray makes it a spectacular choice to use in a bridal bouquet, as aisle markers or you can insert the stem into the 4 holes on the top plate of a Roman Pillar Column with room left over for other accent pieces. 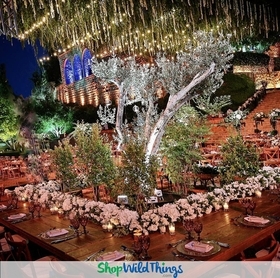 See how incredible hanging florals look when used for Overhead Floral Chandeliers! Even small displays of flowers waterfalling down make such an elegant, visual impact. 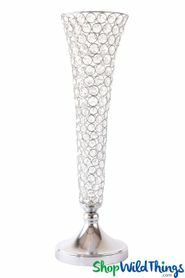 Centerpiece vases like the Mermaid or Trumpet styles provide a statuesque vessel to show off the exquisite blooms or you can drape this spray over the front of head tables with sparkling crystal strands. Luxurious, sophisticated and very little effort! For weddings, events, galas and festivities, let us take the stress off of you by providing not only gorgeous floral choices, but very near to real floral choices! These exceeded my expectations and I may end up ordering more!